America Economía, a magazine on economics in Latin America, has published an article by OPHI Co-Founder John Hammock about the 22 September UNGA Side Event. The op-ed discusses outcomes of the meeting, in particular the agreement on the important role that multidimensional poverty indices (MPIs) must play in addressing the Sustainable Development Goals. Latin American countries have had a leadership role in developing and promoting the use of MPIs, and several of them were represented at the meeting, which included statements from President Juan Manuel Santos of Colombia, President Juan Orlando Hernández of Honduras, President Luis Guillermo Solís of Costa Rica, and Minister Gabriela Rosero of Ecuador. Read the full article (in Spanish) here. The Cuban newspaper Granma has published an article on the Multidimensional Poverty Index Workshop carried out in Havana, Cuba, on September 29 and 30. Sabina Alkire and John Hammock, from OPHI, participated in the workshop. The New York Times has quoted the Global Multidimensional Poverty Index (MPI) 2014 in an article on the progress against poverty. The article by Anna Bernasek references the Global MPI 2014 calculations that put the number of multidimensionally poor people in the world at 1.6 billion. This in contrast to the World Bank’s $1.25 a day income-based estimation that has found 1 billion people to be in poverty worldwide. The Global MPI was calculated for 108 countries by OPHI in June 2014. Of the 1.6 billion people identified as multidimensionally poor, most live in South Asia (52%), followed by Sub-Saharan Africa (29%). The majority of MPI poor people (71%) live in Middle Income Countries. The calculations also revealed that nearly all countries that reduced MPI poverty also reduced inequality among the poor. Of 34 countries for which were studied for changes over time, 30 – covering 98% of the poor people across all 34 – significantly reduced multidimensional poverty. Read the full article published by The New York Times: A Global Gauge Finds Progress Against Poverty. Click on the graphs button (top right corner) to see a comparison of the poverty figures for Global MPI 2014 and $1.25 a day on OPHI’s interactive databank. Find out more about the Global MPI 2014. The Nigerian newspaper This Day Live has published an article on the Global Multidimensional Poverty Index (MPI) 2014. The Global MPI briefing for Nigeria was referenced by former minister of the National Planning Commission Dr. Shamsuddeen Usman, who delivered a keynote address in Abuja at the 25th anniversary lecture of the Nigeria Deposit Insurance Corporation. Usman noted that policymakers need to empathise and have a feel of what poverty really is in order to design effective alleviation programmes. The Global MPI, calculated by OPHI in June 2014, revealed that 43.3 per cent of the Nigerian population are multidimensionally poor, including 25.3 per cent who live in severe poverty. A further 19.3 per cent of the population are vulnerable to poverty. The findings also showed that 57.5% of those living in rural areas are multidimensionally poor. Nigeria is a member of the Multidimensional Poverty Peer Network (MPPN). Read more about Nigeria’s participation in the MPPN. Read the full article published by This Day Live: ‘New Oxford Report Puts Nigeria’s Poverty rate at 43.3%’. Find out more about the Global MPI 2014 and findings for Nigeria. The Global Multidimensional Poverty Index (MPI) 2014 was launched on 16 June 2014 with presentations by the co-authors Ana Vaz, Suman Seth, Adriana Conconi and Sabina Alkire (from left to right, right). To access all the Global MPI 2014 resources, click here. The index was the focus of a feature in prestigious magazine The Atlantic. ‘Good news: Economists at Oxford have come up with a better method for measuring global poverty,’ states the strapline. ‘[The Global MPI 2014] is being touted as the most accurate reflection of the world’s poor, a sort of census of the global impoverished population,’ it goes on to say. You can read the feature in full here. The launch of the Global MPI 2014 was also heralded on Duncan Green’s high-profile ‘From Poverty to Power‘ blog on 16 June 2014. Green describes the index as ‘fascinating’; ‘every now and then, I get caught up in some of the nerdy excitement generated by measuring the state of the world,’ he writes. You can read the post in full here. Green’s blog was re-published widely, including on the World Bank’s People, Spaces, Deliberation blog. Voice of America (VOA) also covered the launch of the Global MPI 2014, publishing an article titled ‘Poverty Called Multidimensional‘. The article features an interview with OPHI’s Director Sabina Alkire in which she explains the need for a multidimensional measure of poverty to complement income measures. The Global MPI 2014 findings were also picked up in India; RTT News and The Hindu BusinessLine ran stories under the headline ‘India is poorest in South Asia after Afghanistan’, while the Hindustan Times went with ‘343mn people destitute in India: Oxford study’. Devex and The Practitioner Hub blog both covered the launch, and Oxford University’s website ran a feature titled ‘Half of the world’s poor classed as ‘destitute’‘. The launch was also flagged up by Andy Sumner in an article for the Global Policy Journal. Sumner, who co-directs the International Development Institute at Kings’ College London, analyses expected revisions in income poverty estimates and suggests more attention should be given to multidimensional poverty data in the article, titled ‘Did Global Poverty just fall a lot, quite a bit or not at all?’. Pakistan’s Ministry of Planning, Development and Reform, the UN Development Programme (UNDP) and OPHI have signed an agreement to develop a Multidimensional Poverty Index (MPI) for Pakistan. The signing marks the beginning of the process of regularly calculating a new poverty index for Pakistan which will be based on the Alkire Foster method developed at OPHI. This method underlies the Global MPI, an international measure of acute poverty covering over 100 developing countries which has been calculated by OPHI and published in UNDP’s flagship Human Development Report since 2010. A comprehensive national report on multidimensional poverty at the district and provincial level is being prepared using Pakistan Social & Living Standard Measurement (PSLM) survey data for the last four to five years, the Dawn newspaper reported. Pakistan’s MPI will enable policymakers to ‘develop robust revenue-sharing formulas for the National Finance Commission and provincial NFC awards for allocation of resources to provinces and districts’, it said. The signing followed a 10-day training course on the AF method at the Pakistan Planning and Management Institute in Islamabad (pictured right), which was run by OPHI’s Director Sabina Alkire (pictured right in the photo above) with researchers Adriana Conconi and Moizza Sarwar. In addition to the report in the Dawn newspaper, the signing was covered by The News, The Hindu, The Express Tribune, The Nation, Pakistan Today and the Business Recorder. The Huffington Post has published an article by OPHI Director Sabina Alkire titled ‘To end poverty we need to understand it better‘, in which she argues for a new measure post-2015 that accurately captures poor people’s experiences of poverty. The post was one of a series published by panellists taking part in Intelligence Squared’s ‘Can we really end poverty? A debate on the future of development’, held in London on Thursday 5 December. OPHI’s Director Sabina Alkire took part in a live Q&A titled ‘Can we trust the UN to end global poverty?’ on the Guardian Global Development website on 25 September. Alkire joined a panel of experts to discuss the intricacies of the UN general assembly, the MDGs and the post-2015 process. Key messages to emerge were that the UN alone cannot eradicate poverty and more national responsibility was needed in meeting the MDG goals. The role of the UN in the discussion emerged as one to inspire key stakeholders from multiple sectors. Additionally panelists and questioners unanimously supported a rights-based approach towards development goals. The panel also included Tony German, executive director of Development Initiatives, which recently carried out analysis on how much it will cost to eradicate poverty; Farah Mihlar, South Asia expert for Minority Rights Group, who recently interviewed minority and indigenous activists to get their perspectives on the post-2015 process; and Liz Ford, deputy editor of the Guardian’s Global Development site, who reported from the 68th UN General Assembly. The questions and answers posted on the discussion webpage can be viewed in full here. An article by OPHI Director Sabina Alkire has been published in Outreach, a magazine produced by the Stakeholder Forum at international meetings including this week’s UN General Assembly in New York. The Network organised a side-event at the 68th UN General Assembly on 24 September to urge post-2015 actors to include a multidimensional poverty index (MPI) alongside the $1.25/day income measure, to track progress towards non-monetary goals. The proposed MPI2015+ would build on an existing global multidimensional poverty index published in UNDP’s Human Development Reports since 2010. Countries from the Network, such as Colombia, Mexico, Chile, Morocco, Nigeria, Philippines and El Salvador have started work towards the construction of such a poverty measure. The Stakeholder Forum will publish five editions of Outreach to coincide with key events relating to the post-2015 development agenda during the 68th session of the UN General Assembly (20 – 27 September 2013). The content of the daily editions is based on the themes of each event. You can read Alkire’s article in full here. A side-event co-organised by OPHI at the UN General Assembly on 24th September is the subject of an article by the UK’s Guardian newspaper, ‘We need new ways to measure poverty, UN meeting told’. The event included speakers from the governments of Colombia, Mexico, Chile, Philippines and Nigeria, the World Bank, UNDP, OECD and OPHI, who all called on the UN to adopt a new multidimensional poverty measure to help track progress toward the global goals identified for the post-2015 agenda. ‘The international community needs to move away from using economic benchmarks to measure development progress if it is serious about ending extreme poverty, a meeting at the UN has been told,’ the Guardian reported. ‘….Representatives…argued that adopting a multidimensional poverty index (MPI) alongside economic measures would allow countries to get a more nuanced picture of poverty and whether progress towards addressing it was being made,’ it said. Participants recommended that the UN adopt a new multidimensional poverty measure to complement the current $1.25 a day income standard. The assembled Southern governments also shared concrete ways their national multidimensional approaches to measuring poverty are being used for policy coordination, targeting, and monitoring, and are making visible progress that income poverty measures overlook. Read the Guardian article here and find out more about the event here. OPHI’s research on changes to multidimensional poverty over time features in an article on eradicating poverty in this week’s issue of the Economist. The article, titled ‘Growth or safety net?’, looks at the relationship between boosting incomes and reducing poverty, and cites OPHI’s finding that Nepal had reduced multidimensional poverty fastest of 22 countries having data on multidimensional poverty over time, despite being the poorest country in South Asia. 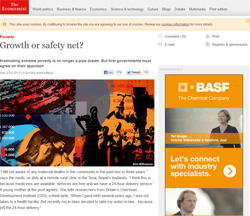 ‘…As Nepal shows, cutting poverty is not just about boosting incomes,’ the author writes. Deprivation, the article explains, takes many forms, including the lack of schools, clean water, medicines and family planning. ‘Using her MPI measure, (OPHI’s Director Sabina Alkire) finds that about one-sixth of Vietnam’s population is poor by income, and one-sixth is “multidimensionally poor”. But they are not the same people: only about a third of the groups overlap,’ it says. The article goes on to describe how charities and others are urging the governments meeting in New York this week for the 68th session of the UN General Assembly to adopt exacting targets for non-income measures of deprivation. OPHI, together with the German Ministry for Economic Cooperation and Development, CONEVAL of Mexico, the Department for Social Prosperity of Colombia, and the new Multidimensional Poverty Peer Network, will hold an event at the UN to call for a new multidimensional poverty index (MPI) 2015+ to support the post-2015 development goals. You can watch a live webcast of the event on Tuesday 24 September at 1.15-2.30 pm (EST) at http://webtv.un.org. You can read the Economist article in full here. You can find out more about the event ‘Multidimensional poverty measurement in the post-2015 development context’ here. El Salvadoran newspaper La Prensa has published an article on a new poverty measure being developed in the country. The article, in Spanish, cites the Technical Secretariat of the Presidency of El Salvador (STP) and the United Nations Development Program (UNDP) in the country as the main developers of a multidimensional methodology for poverty measurement in the country. The Government of El Salvador in collaboration with the UNDP had considered various measures before piloting a multidimensional poverty measure that has been used to generate new data. The process has been carried out over two years and it is expected that the measure will be launched in 2014, according to William Pleitez, the Chief Economist at UNDP, El Salvador. The country is a member of the Multidimensional Poverty Peer Network launched in Oxford, in June 2013. OPHI Director Sabina Alkire was interviewed by La Prensa in her role as adviser to the government of El Salvador on multidimensional poverty. Alkire explained the importance of adding poverty measures that go beyond income in capturing the full experience of poverty, and lauded the government’s two-year effort to collate information from poor people on the dimensions of poverty relevant to their lives. You can read the full article in La Prensa, in Spanish, here, while the interview with Alkire is available to read here. Find out more about the Multidimensional Poverty Peer Network and its members here. Nicaraguan newspaper La Prensa has published an interview with OPHI Director Sabina Alkire on the topic of unidimensional and multidimensional poverty in Latin America. The article, in Spanish, discusses different understandings of poverty around the world; the prospects for decreasing poverty in Nicaragua; and the World Bank’s goal to eradicate extreme poverty by 2030. In the interview, Alkire stresses the importance of listening to poor people’s views about the dimensions that constitute their experience of poverty. She also talks about how multidimensional poverty measures provide policymakers with a way to reflect the multiple concerns of poor people in anti-poverty programmes. Read the full article in Spanish here. To get an overview of OPHI’s work in Latin America, visit our website here. A speech by Edwin St. Catherine, Director of Statistics at St Lucia’s Central Statistical Office, on the topic ‘Measuring Multidimensional Poverty in Barbados and the OECS (Organization of Eastern Caribbean States)’, has been covered by Grenadian newspaper the Barnacle. St. Catherine emphasised the need for a multidimensional measure that captured the impact of policies and showed policymakers the way forward for specific interventions in poverty alleviation. The Director is a graduate of OPHI’s 2013 Summer School in Multidimensional Poverty Analysis. You can read the full article here, and find out more about our previous and upcoming summer schools here. The Canadian International Council’s (CIC) digital media platform, OpenCanada.org has published an interview with OPHI Director, Sabina Alkire on the new Multidimensional Poverty Peer Network (MPPN) and the MPI 2.0 (now known as the MPI 2015+). The article describes what multidimensional measures reflect in countries such as Ethiopia and Nepal and how such measures are key to moving forward the Millennium Development Goals after 2015. Together with the governments of Germany, Colombia and Mexico and Ministers from 20 countries, the MPPN has decided to advocate for a multidimensional poverty index (MPI 2015+ ) in a post-2015 context. “They felt that a global and internationally comparable headline of multidimensional poverty would really add value to a list of individual indicators. One of the things OPHI is working on is a proposal for there to be an indicator – complementing the $1.25-a-day indicator – of multidimensional poverty that gives an at-a-glance figure of how people’s lives are going in other dimensions,” Alkire said in the interview. OPHI Director Sabina Alkire has described the charge of many critics that India’s National Food Security Bill (NFSB) is excessive as ‘exceedingly strange’ in an opinion piece published by The Hindu. Alkire argues that expenditure on providing food security will add minimally to public spending, and compares India’s fiscal priorities with those of other countries in Asia, where, she says, governments across the political spectrum invest more in social protection. The Hindu is an English-language Indian daily newspaper. You can read Alkire’s article, titled ‘This bill won’t eat your money’, in full here. OPHI Director Sabina Alkire has contributed to a feature published by SciDevNet discussing the future role of Least Developed Countries (LDCs) in the post-2015 context following the release of a briefing paper by the LDC Independent Expert Group. The paper, ‘Taking a lead on the post-2015 agenda: priorities for least developed countries’, highlights the need for two-way cooperation between high and low income countries in the pursuit of development goals, and calls for the recognition of the expertise of LDCs, especially with regard to sustainable development. Alkire welcomed the findings of the report, noting that many of the poorest countries have achieved more in terms of reducing non-income poverty than their wealthier counterparts. However, she would have liked the report to go further and recognise LDC expertise on the issue of women’s empowerment and their leadership. Read the SciDevNet feature in full here. OPHI Director Sabina Alkire has given a presentation via Skype to the University of Central America (UCA) in Managua, Nicaragua, on multidimensional aspects of poverty, arguing for a movement beyond measuring poverty using Gross Domestic Product (GDP) and consumption alone. Her talk was covered by the Nicaraguan newspaper La Prensa. Alkire’s speech was given at the invitation of the University of Central America (UCA) as part of its Human Development Series of seminars. This series consists of four lectures in total, given to a wide-ranging audience of students, professors and guests in Managua, on topics related to human development. The lectures are being given in the run-up to the OPHI-HDCA Intensive Spanish-language Training Course 2013 on Multidimensional Poverty Analysis, which will be held in Managua in September. OPHI Research Associate and Co-Founder John Hammock gave the first lecture in this series on the ‘Ethics of Development’ when he was in Nicaragua earlier this year. James Foster, Professor of Economics and International Affairs at the Elliott School of International Affairs at George Washington University, and another OPHI Research Associate, gave a seminar via Skype on multidimensional poverty measurement. The final lecture of the series will be given by Jorge Pineda of the UN’s Development Program (UNDP). Vietnam’s Vice-Minister of Labor and Social Affairs, Nguyen Trong Dam, has announced that he will join the global Multidimensional Poverty Peer Network that was formally launched on 6-7 June, as Vietnam moves to adopt a multidimensional framework for measuring poverty. 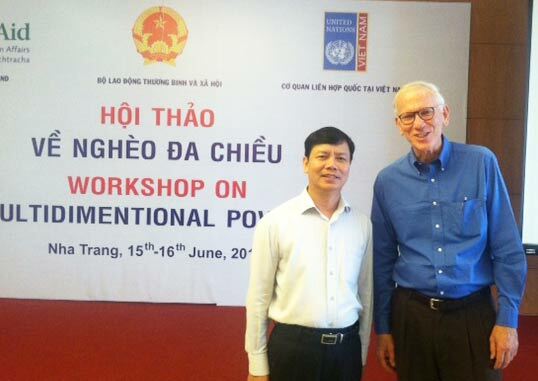 Vice-Minister Dam’s announcement came at the end of a workshop on multidimensional poverty in Nha Trang, at which OPHI Research Associate John Hammock presented the Alkire Foster method of multidimensional measurement, and described how it is being applied in Mexico, Colombia, Bhutan and other countries. The workshop brought together close to 100 participants from the national government, academia and think tanks, as well as representatives of ethnic minorities and local communities. At the end of the workshop, Vice-Minister Dam set out a timetable for establishing a national Multidimensional Poverty Index (MPI) to be included in Vietnam’s 2015-2020 National Plan. The Vice-Minister expressed his intention to visit other members of the Multidimensional Poverty Peer Network who are implementing national measures, in order to learn from their experiences. The network was formally launched in Oxford by President Juan Manuel Santos of Colombia and high-level representatives of Mexico and around 20 other governments. The Ministry of Labor and Social Affairs’ decision to move to a multidimensional approach to poverty measurement was covered by the Vietnamese media, including Việt Nam News, the national English-language daily. You can read the article in full here. The launch of the Multidimensional Poverty Peer Network by President Juan Manuel Santos of Colombia and high-level representatives from Mexico and around 20 other governments in Oxford on 6 June has made the news in Spanish-language media around the world. In Colombia, the event was covered by El Colombiano, El Espectador, El Heraldo, El Nuevo Herald, El País, El Tiempo, Colombia Reports and Colombia Politics. It was covered live by W Radio Colombia, and also featured on Radio Nacional de Colombia, Caracol Radio and Radio Santa Fe. Across the Americas, it was covered by Terra in Brazil, El Economista in Mexico and La Opinión in the US, among others. You can listen to an interview conducted by W Radio Colombia with Sabina Alkire on 5 June here. You can also hear interviews the radio station conducted at the Policy Symposium in Magdalen College on 6 June; listen to Dr Paulo de Martino Januzzi, Brazil’s National Secretary of Evaluation and Information Management, here, and Dr Gonzalo Hernández Licona, Executive Secretary of Mexico’s National Council for the Evaluation of Social Development Policy (CONEVAL), here. The Multidimensional Poverty Peer Network will provide support for countries that are considering or developing official measures of multidimensional poverty based on the Alkire Foster method developed at OPHI. The method provides policymakers with an intuitive yet detailed picture of poverty that shows the number of poor people and the overlapping ways in which they are deprived. OPHI Director Sabina Alkire took part in a discussion on global poverty on BBC Radio 4’s Today programme on 1 June, arguing that over the next generation there is a possibility to lift the whole of humanity out of extreme income and multidimensional poverty. Alkire and Jeremy Lefroy, Conservative MP and member of Trade Out of Poverty, discussed whether capitalism and free markets, rather than good governance and social programmes, were the answer to ending poverty. Lefroy emphasized the utility of trade in creating new jobs, which are necessary for economic growth and to raise the taxes needed to provide finances for development goals. Alkire noted that research has shown that economic growth may have little or no correlation with non-income development goals on issues such as child mortality or the number of children out of school. ‘That’s a shocking finding, because we would assume them to walk in lockstep and they don’t,’ she said. You can listen to the discussion on the Today programme here. 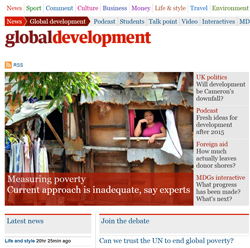 A blog by OPHI Director Sabina Alkire on measuring poverty in the post-2015 development context is featured in the Overseas Development Institute’s (ODI) latest Development Progress e-newsletter. ODI’s Development Progress launched a debate in May about how poverty should be measured in a post-2015 framework. Alongside Alkire’s blog, the May newsletter features posts by Martin Ravallion, the Edmond D. Villani Professor of Economics at Georgetown University, Washington DC; Lant Pritchett, Senior Fellow at the Center for Global Development and Professor of the Practice of International Development (on leave) at Harvard’s Kennedy School of Government; and Stephan Klasen, Professor of Development Economics and Empirical Economic Research at the University of Göttingen. Ravallion’s blog argues that a new poverty target should continue to be based on a $1.25/day poverty line alongside a ‘weakly relative’ poverty line, so that absolute poverty is given primacy but relative poverty is also taken into account. Pritchett’s post makes the case for higher international poverty lines, while Klasen’s blog focuses on internationally coordinated national poverty lines, based on consistent measurement of poverty at the national level. Alkire’s blog drew attention to the mismatch between income poverty and other dimensions of poverty, noting that research shows that trends in $1.25/day income poverty and multidimensional poverty do not move in lockstep (see Alkire and Roche, 2013). Alkire makes the case for a measure based on the global Multidimensional Poverty Index (MPI), which would complement an income poverty measure by revealing the simultaneous disadvantages in health, education and living standards a person is experiencing. Alkire recently co-authored a briefing on ‘Multidimensional Poverty and the Post-2015 MDGs’ with OPHI Research Associate Andy Sumner, Co-Director of the King’s International Development Institute at King’s College London. Read the Development Progress May 2013 E-newsletter in full. OPHI Research Officer José Manuel Roche was one of the guests on a Voice of Russia panel discussion on ‘Poverty: living below the line’ on 8 May. With thousands of people across the UK taking part in the ‘Live Below the Line’ challenge, to eat for a week on just five pounds (US$7.74), the radio programme looked at how poverty is defined around the world and the difficulties involved in measuring it. Alongside Roche on the panel were Elisha London, UK Country Director for the Global Poverty Project, which launched the ‘Live Below the Line’ initiative, and Syed Rahman Raju, an academic at Dhaka’s Daffodil University who has written extensively on food security in Bangladesh. Roche drew attention to the difficulties of measuring poverty according to income alone, from the disparities in prices between countries, regions, and urban and rural contexts, to the need to take into account the effect of a consumer’s knowledge and education on their buying decisions, and the lack of goods to buy in areas affected by natural disasters such as drought. Voice of Russia is the Russian government’s international radio broadcasting service, and broadcasts globally to an audience of around 109 million. You can listen to a recording of the full half-hour discussion here. OPHI Co-Founder and Research Associate John Hammock has appeared in the Spanish newspaper El País as part of a front-page interview with the President of Colombia, written by the Editor-in-Chief, Javier Moreno. Hammock was present at an event at which President Juan Manuel Santos announced a reduction in multidimensional poverty, two years after his government implemented a national Multidimensional Poverty Index (the MPI-Colombia) that uses the Alkire Foster method (see ‘Colombia’s President announces fall in multidimensional poverty’). Hammock explained to the press and many senior government officials at the event how OPHI had worked with the Colombian government to develop the index, which has dimensions and indicators devised by the government to meet its specific needs and public policy priorities in order to inform poverty reduction strategies. Colombia’s President Juan Manuel Santos has announced a fall in multidimensional poverty, two years after his government implemented a national Multidimensional Poverty Index (the MPI-Colombia) that uses the Alkire Foster method. OPHI began working with the Colombian government’s Ministry of Planning in 2010 to construct the new measure, which underlies firm and binding targets to close the country’s multidimensional poverty gaps. The dimensions and indicators were devised by Colombia to meet its specific needs and public policy priorities in order to inform poverty reduction strategies. Based on national statistics, the MPI-Colombia showed a drop in multidimensional poverty, from 29.4% in 2011 to 27% in 2012. President Santos said his government had also reduced the income poverty rate from 34.1% to 32.7% in two years, lifting some 1.7 million people out of poverty. OPHI Co-Founder and Research Associate John Hammock took part in the meeting of the Inter-Ministerial Poverty Coordinating Committee where the results were announced. The news was widely covered in the media, both in Colombia (see El Tiempo, El Espectador, La República, Portafolio, El Universal, Semana) and further afield; for example in China (see Xinhua and China Daily). Hammock earlier gave a presentation on multidimensional poverty measures at the Universidad Centroamericana (UCA) in Managua, Nicaragua, which will host a Spanish-language intensive training course to be run by OPHI from 30 August – 7 September 2013. Access to household utilities and living conditions. The five dimensions are equally weighted and use 15 indicators. Find out more. OPHI’s analyses of the global MPI figures published in UNDP’s Human Development Report 2013 have been attracting attention around the world. See below for selected coverage. Nepal’s eye-catching reduction in multidimensional poverty, as measured by the global MPI and announced in Kathmandu by OPHI Director Sabina Alkire, has been reported by media including the Himalayan Times and the Kathmandu Post. Alkire presented the concept and methodology of the MPI at an event organised by the UN Development Programme following the launch of UNDP’s flagship Human Development Report 2013. The MPI was developed by OPHI with UNDP for publication in the HDR, and has featured in the report since 2010. For more information on Nepal’s dramatic reduction in multidimensional poverty, see the OPHI briefing ‘How Multidimensional Poverty went down: Dynamics and Comparisons’. Danish newspaper Kristeligt Dagblad has published an interview with OPHI Director Sabina Alkire on multidimensional poverty measurement. The article describes how the Alkire Foster method can be used to capture different dimensions of poverty, and makes it possible to identify poor people living in middle-income countries. “Our method demonstrates that there is no automatic link between economic growth and poverty eradication. India, for example, had a much higher economic growth than Bangladesh, but in terms of social indicators, Bangladesh has been more effective in reducing poverty, ” Alkire told the newspaper. You can read the article in Danish here. Colombia has shown a strong commitment to using the results of a multidimensional poverty measure to set goals for social policies, OPHI Research Officer Diego Zavaleta has told the economic newspaper ‘Portfolio’ in an interview. Government ministries have used the data generated by Colombia’s Multidimensional Poverty Index (MPI) to inform public policies and programmes such as ‘Más Familias en Acción’ (‘More Families in Action’) and ‘Red Unidos’ (‘Red States’), because it gives a more complete picture of who is poor and how they are deprived, Zavaleta said. In 2011, the Government of Colombia adopted a national MPI which assesses social and health-related aspects of poverty in five dimensions. Each of the indicators in the national MPI reflects the goals and targets of Colombia’s pioneering poverty-reduction strategy. It is a powerful example of how the Alkire Foster method of multidimensional measurement can inform such strategies and help to create a clear system of accountabiliy. “The methodology is adjustable, so you can change the variables and relevant topics of analysis, depending on the interests of each nation,” Zavaleta told ‘Portfolio’. You can read the full interview, in Spanish, here. OPHI Director Sabina Alkire has called for the World Bank to think carefully about how it defines and targets poverty, in an article on the strategy set out by the bank’s new president, Jim Yong Kim. Kim has voiced his desire to end poverty and build a ‘solutions bank’, but has not yet set targets or given details on how the bank will go about this. In an article by the Bretton Woods Project, a watchdog which scrutinises the World Bank and International Monetary Fund, Alkire welcomed Kim’s determination to end absolute poverty, but expressed her concern about other aspects of poverty that are missed by a focus on income. “I’m hoping that the World Bank will think carefully about how it defines and targets poverty, so that its measures support seamless work towards eradicating deprivations in education, health, nutrition, assets, services and livelihoods, as well as in income,” she said. The article, ‘Kim’s World Bank strategy: real change or “PR exercise”?’, refers to the emerging data from countries around the world which were the focus of the workshop held last month by OPHI and the University of Göttingen, entitled ‘Dynamic Comparison between Multidimensional Poverty and Monetary Poverty’. “For each country, we compared multidimensional poverty with monetary poverty using the same dataset,” Alkire explained. “When the multidimensional measure did not include income as an indicator, 40 per cent to 80 per cent of multidimensionally poor people were not identified as income poor (the headcounts of poor persons matched for both income and multidimensional poverty). When each measure focused on the poorest of the poor, the mismatch between definitions of poverty was higher. “This mismatch needs to be explored as the World Bank considers what targets to set itself to best achieve its goal of ending poverty.” Read more. “Economics is poised to change, but how is not yet clear,” she writes in an op-ed following the energetic discussions on how to develop a new economic paradigm. “What is clear is that moral and intellectual leadership is essential. Bhutan’s new commission provides an invaluable opportunity to begin constructing a roadmap for a new multidimensional model of sustainable welfare economics, founded in human well-being.” Read the article. Keynote Speaker, Dr Sabina Alkire of the Oxford University’s Poverty and Human Development Initiative said the measurement of poverty needs to take into account multi-faceted nature of deprivations faced by the poor. Colombia’s influential magazine Semana has written on the new Multidimensional Poverty Index (MPI-Colombia), launched by the country’s President, Juan Manuel Santos, in August 2011. Developed using an innovative adaptation of a technique for measuring poverty and wellbeing created by OPHI, the MPI-Colombia is tied to firm targets to close the country’s poverty gaps. Read more. The groundbreaking new measure was also covered by Reuters (AlertNet) “Colombia adopts new poverty index measure” and by Jonathan Glennie in the UK’s Guardian newspaper “Colombia’s new index to measure poverty merits a cautious welcome“. Corrections to some factual errors in the piece appear below in the comments section. Sabina Alkire, OPHI’s Director, has contributed to an Economist online debate on the need for new measures of economic and social progress. Joining the discussion begun by Richard Layard and Paul Ormerod, her post puts forward OPHI’s view of why new – multidimensional – measures of wellbeing are not only necessary, but also long overdue. The comment is on the right-hand side of the page – just scroll down a little to see it: Economist Happiness debate.